The Herman Miller Leasing Program is a partnership between Herman Miller and LEAF Commercial Capital. Utilize this convenient service to quickly finance your products and services including technology, interior design, warehousing, moving, and installation. Our flexible programs allow you to choose between returning, purchasing, or extending your lease at competitive rates. 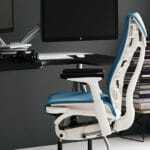 Contact your local Herman Miller dealer today to show you how we can help to improve your space with our exceptional products. Interested in furniture rental? Many companies elect to rent some or all of their furniture. Herman Miller has partnered with Cort Furniture Rental, a world-class national rental company whose services include space planning assistance, one-stop service, and leasing options.